Answer: Pam, almost every plant lover and gardener has dreamed of owning a greenhouse at one time or another. Some of the questions facing them are: What kind to get? How big should it be? How much does it cost to purchase and operate? How should it be heated? There was a time when acquiring a greenhouse meant going to a greenhouse builder and having an individual greenhouse constructed for the particular garden and needs. Today you can pick out your greenhouse from a catalog. Prefabrication and improved, versatile design are the keys to the modern home greenhouse. Starting first with design, manufacturers have developed compact greenhouses that can be used to grow almost any plant you wish, yet will look good in any garden setting. In addition, they have designed them in sections, prefabricated, so the purchaser can assemble them (portable greenhouses) with simple tools in a matter of hours. Some people may feel that prefabrication limits the sizes and types available – a misconception. 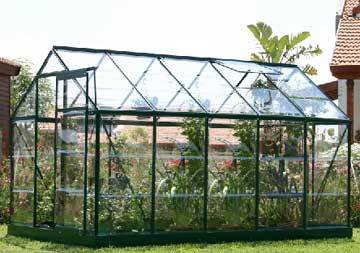 There are several models of “one-size” greenhouses available – several manufacturers have one or two – but most home greenhouses are available in sections which are fitted together. So the length of your greenhouse will be determined by the number of sections you purchase. Widths too, vary, as most manufacturers make several – 10 to 15 feet. In addition to even-span greenhouses – the conventional kind – you can also get the lean-to in prefabricated form in almost any length and in various widths. You can purchase a prefabricated greenhouse to stand alone as a separate unit (free-standing) or one which can be attached to an existing wall. What size greenhouse to purchase is the next question. The answer depends a lot on you. For instance, the room available on your property means a great deal. If the garden is small, so must your greenhouse be small. If room is plentiful, the size is determined by how much time you have to care for a greenhouse, the number of plants you want to grow and, of course, how much you can spend. Try to be generous with your greenhouse, though, because the lament of many greenhouse owners is: “I wish I had put up a larger one.” With most prefabricated greenhouses it is possible to add sections at a later date, but it is wiser and less expensive to erect a larger one at the outset. You also have a choice as to the type of construction. Home greenhouses come made of wood, aluminum and even PVC. Wood use to be the standard for many years – there are wooden greenhouses fifty or sixty years old still in excellent shape. Aluminum or steel is probably the standard today, having made its appearance during the last 50-60 years. Wooden greenhouses have to be painted outside and inside regularly, and while aluminum houses don’t, they are initially more expensive. Many DIY greenhouse builders use PVC as an inexpensive building alternative. If you live in the South and West you won’t have to worry too much about heat for your greenhouse. All you will need is something to take care of an occasional chill. An inexpensive electric heater works nicely for this. If you live in the North, though, heat for your greenhouse is quite important. There are many ways to heat a greenhouse. If the greenhouse is attached to, or is within a few feet of the house, it may be possible to heat it from the existing house furnace. This is most easily done when the home heating system is either hot water or natural gas. It may also be possible with warm air, but it is not generally as effective as hot water or a boiler. This will involve plumbing, but many greenhouse manufacturers supply plans and instructions for this installation. The other means for heating a greenhouse is by the use of individual units. These could include units heated by bottled or natural gas, electricity, oil and solar. Home greenhouses can be successfully heated with space heaters as well as hot-water boiler systems. The most important thing with any heating system is to have it thermostatically controlled. Many people couldn’t operate a greenhouse without automatically controlled heat. Without it, you would have to give your greenhouse almost constant attention throughout the heating months – night and day. Another automatic control which should be considered seriously at the time of purchase is ventilation. Ventilation of your greenhouse would demand constant attention without the aid of automatic controls. It may not be necessary to have a control on every ventilator, but half the roof ventilators should be automatic to maintain proper air movement and temperature during the daytime. Automatic humidification is being installed more and more in home greenhouses. This is quite important in some of the warmer and drier sections of the country, notably the South and West. Although this is a grand addition to any greenhouse setup, it isn’t as important as heat and ventilation – however, many greenhouse gardeners may disagree. This system can be installed easily after the greenhouse is in operation if there is a need for it. With your greenhouse and these controls to start with you are in the business of greenhouse gardening. For more information on greenhouse types, sizes and additional equipment, the search for a list of manufacturers and ask for a catalog and even a DVD of their products. And… make sure you ask lots of questions.